The sod was turned and construction officially began for the new St John the Evangelist school last Wednesday. The new school should be finished in time for September, 2018, and it sounds fantastic. The kids will have more space, a large outdoor playground on top of the UPX tunnel, and air conditioning. In the 21st century! Close to 40 people braved chilly temperatures and cloudy skies to visit some key parts of our Weston neighbourhood. Organizers Cherie Hurst and Mary Louise Ashbourne led a well-attended Janes Walk today organized under the banner of the Weston Historical Society. The theme was one of renewal and there was a pervasive sense of a dynamic new Weston emerging after decades of decline and neglect. The tour started at the GO / UP Express station where local historian Mary Louise Ashbourne joked that Weston had suffered with lemons for years, but now, thanks to community activism, we were beginning to get some lemonade. Some of that lemonade takes the form of a fast, frequent connection to the airport or downtown for a cost comparable to the GO train. Directly across the street is Frontlines where Executive Director Stachen Frederick welcomed us into the warmth of the clubhouse and described the large variety of programs for young people that are offered. These include a homework club, very popular cooking classes and a summer day camp. This year’s fundraising dinner at the Weston Golf and Country Club was sold out for the first time ever, raising over $20,000 that will help subsidize programming for the next year. Pizza from their cooking program was offered as an incentive to return following the walk. Frontlines Executive Director Stachen Frederick talking about the extensive programming for youth. (Photo courtesy Cherri Hurst). Cherie Hurst and Dave Bennett welcome walkers into the Weston Historical Society offices. After visiting the offices of the Weston Historical Society (WHS) at 1901 Weston Road, Deacon John Frogley Rawlinson outlined the history of Weston Park Baptist Church. The church is involved in a new venture under discussion for several years that will combine church lands with the empty ScotiaBank building that will be preserved as part of the development. Deacon John Frogley Rawlinson describes the Weston Park Baptist Church development. The mural behind him is of the old Eagle Hotel which once stood at the corner of Weston and Lawrence. We crossed the road and walked north to 1976 Weston Road to Toronto’s longest running bookstore, Squibbs now celebrating 90 years of continuous operation and 84 years at number 1976. Co-owners, Mike Linsky and Suri Weinberg-Linsky greeted walkers and invited them inside. At Weston Road and Little Avenue, Mary Louise stopped at the Carrying Place plaque (installed by the WHS) that marks the trail that ran along the Humber for hundreds of years linking Lakes Ontario and Simcoe, eventually hitting navigable water again at the Holland River. That would have been a tough portage as the navigable part of the Humber ended at the present day location of Bloor Street. Weston’s old Federal / Post office building has been preserved and is now a medical building that has been equipped to serve the health needs of the community. Dr. James Crumney outlined the history of the building and some of its interesting occupants over the years including an RCMP detachment that kept an eye on postal workers via one-way mirrors. At Fern avenue and Weston, Jessica Idahosa told the group about St John’s Anglican which is Weston’s oldest church having been in operation since 1856. It is now operated by the Victory Assembly under the leadership of Pastor Felix Ayomike whose congregation started out as a group of five people meeting in a private home. Incidentally, that’s exactly the way St. Johns began in 1856. Moving along Fern Avenue, the Gardhouse home at 18 Fern and the LeMaire home at 57 George Street were occupied by prominent Westonians at the turn of the 20th Century. The Gardhouse home was saved from demolition as a result of WHS and community intervention. Heading down George Street, Weston St. John’s School Community Social Planning Council co-chair, Dave Bennett outlined the huge amount of planning and work involved in rebuilding the school that will soon occupy the currently empty site. Because of expropriations needed for the UP Express, St John’s will be able to occupy a bigger site, hold more pupils and have a grass playground for the first time thanks to the Weston Tunnel cover. Heading down George to King Street, Artscape Research and Development Manager, Gil Meslin outlined the new homes and community facilities that will house artists and even the Farmers Market when the new Weston Common is scheduled to be completed in 2018. Gil Meslin describes what the future holds for the Artscape Hub in Weston. At the junction of King Street and Weston Road, our famous 103 year-old Carnegie Library still stands thanks to community involvement. It is a small but impressive building with is Arts and Crafts style and original detail. The walk ended all too soon and was an exciting glimpse into the past, present and future of Weston, ending at the mural on the side of the Perfect Blend Cafe which like other such murals in Weston exemplifies the changes in our community over the past few decades. The walk certainly illustrated that positive changes in Weston have been as a result of direct community involvement in the political process. Much of our history has sadly been lost but much has been preserved thanks to a dedicated group of volunteers. We can only guess what future murals will look like but then, that’s up to all of us isn’t it? The Sun profiled Marc Porlier, the man allegedly behind the arson at St John the Evangelist Church. Porlier, the article says, was once an altar boy at the very church he tried to set fire to. While the defence lawyer wouldn’t comment on any animosity her client may have had toward the church, she acknowledged bizarre videos Porlier posted online in recent years — all entitled “The Gospel according to Marc” — provide insight into his feelings on Catholicism. “I’d like to say that I didn’t like being brainwashed, but as a kid I actually wanted to be a priest,” he says. Now that the dust has settled after October’s Federal Election, I was curious as to how former York South-Weston Member of Parliament, Mike Sullivan was adjusting to the new reality of being a regular citizen once more. He agreed to an in-depth interview and we sat down last Friday over coffees in a busy Perfect Blend Bakery. We touched on four main topics that are being published over a four day period. The first topic was Fallout from the election. The second issue that we discussed is the Weston Cultural Hub. I’m of two minds (about the Hub). There are several things that make me nervous about it. One is the extent that the councillor is trying to get local buy-in from community organizations. There are secret meetings between community organizations and the developer and they’re happening outside the public eye. The essence of what I can gather from this scheme is that Rockport gets to build a 30 storey tower without a parking garage so it’s significantly cheaper for them on city land that they’re essentially being given; and they’re getting money. The current and former municipal administrations have not paid a whole lot of attention to Weston and Mount Dennis. This part of the City of Toronto has very few if any city services such as community centres such as city offices -anything that is a community service. In response to those who claim that the York Community Centre being built on Black Creek and Eglinton will meet Weston’s needs, Sullivan points out its remote and car oriented location. The new community centre is not here (in Weston) – that’s a regional recreation centre – you have to have a car to get there – you can’t get there as a pedestrian. There’s nothing up here and there hasn’t been and there needs to be. There are 10,000 people already who live in the various buildings along Weston road who have no city facilities and we’re going to add another thousand people or more to that already under-serviced group. Where are the city services that come along with this? We’re getting 8000 square feet of community space but what will be its purpose? We don’t know and it will be gone after 50 years. Sullivan calls 33 King, ‘Weston’s long-term eyesore’ and says that it should never have been put where it was. Sullivan also worries about the increased levels of traffic produced by an extra thousand people who will live in the new 30-storey tower. Residents will park in the existing parking garage that empties onto King Street. He claims that traffic studies of the new Hub ignore the fact that a new 650 student school will be built nearby. I asked (at the meeting) how it was that transportation services accepted completely without question (the report) provided by the developer which ignored an entire school. St John The Evangelist School apparently no longer exists according to that traffic study. So the answer that came from Transportation Services parroted the report from the developer which was that 33 King has the right to that many vehicles and ignored that there will be 650 kids where before there used to be 200 who will be coming and going at rush hour. …the ramp empties directly onto the street with no signalling whatsoever. I hate to say this but it’s only a matter of time before some young person is injured or killed because of the dramatic increase in traffic that will come as the result of 370 units having parking in that building that they didn’t have before. He is concerned that while John Street has been designated a place for Farmers Market vehicles to be parked, it is also a designated fire route. (at the public meeting) I asked what’s going to happen to the Farmers market vehicles because Frances’ (Councillor Nunziata) plan is to turn the Farmers Market into a street market and so that the vehicles will be on John Street. But in one of the newest incarnations of the site plan, John Street will become a fire route. And therefore you cannot park vehicles on the fire route and that question’s not answered. Another important issue for Sullivan is the lack of an easement to guarantee that pedestrian access will not be cut off by the owners of 33 King Street. …the city is planning to make the laneways on the east side of 33 King into a pedestrian passageway. (Dan Harris asked) on several occasions if (the city) would require that to be an easement and the answer from the city is that the owners of 33 King will not give us that – well we’re giving the owners of 33 King $10 million – you’d think you could get an easement out of that, which would then make that walkway a permanent feature. But f they wanted to, the owners could put a fence up and block access at certain times of day. So there needs to be an easement and a re-think of whether we need 30 storeys. Sullivan is also concerned about the precedent of such a tall building causing other, similar applications that will use a token ‘community benefit‘ to justify breaking the City’s planning controls. Already other developers have put in feelers to the city about raising their proposed buildings to 30 storeys – Cruickshank apparently started asking the city about 30 storeys and and the owners at 1775 and 1765 Weston Road who were talking about building low rise commercial in the front are now asking about 30 storey towers. Ms Keesmaat claimed that there would be no precedent as a result of the public amenities that were being provided – you can bet your boots that every developer worth his salt is going to say, “I want 30 storeys too”. We’re going to have another 4 or 5, 30-storey towers with no services. I’m not opposed to the notion that an art community might be an interesting concept but I think you don’t sell your soul to get it. But I’m afraid that this notion of the 30 storey building and the loss of the Farmers Market is like selling our soul. St John the Evangelist may not expand in the way originally envisioned, because of the graves discovered there earlier this year. According to Dave Bennet, “the TCDSB had planned on a land swap with the church to gain access to Fern Avenue, where 4 properties were already purchased.” That land swap now may not happen because the church council will not pave over the to create a parking lot. The Catholic School Board will meet in March 2015 to discuss new options. InsideToronto has more on the changes. The Weston Historical Society has published pictures of the gravestones. They photos are wonderful. Go there. Don’t stay here. 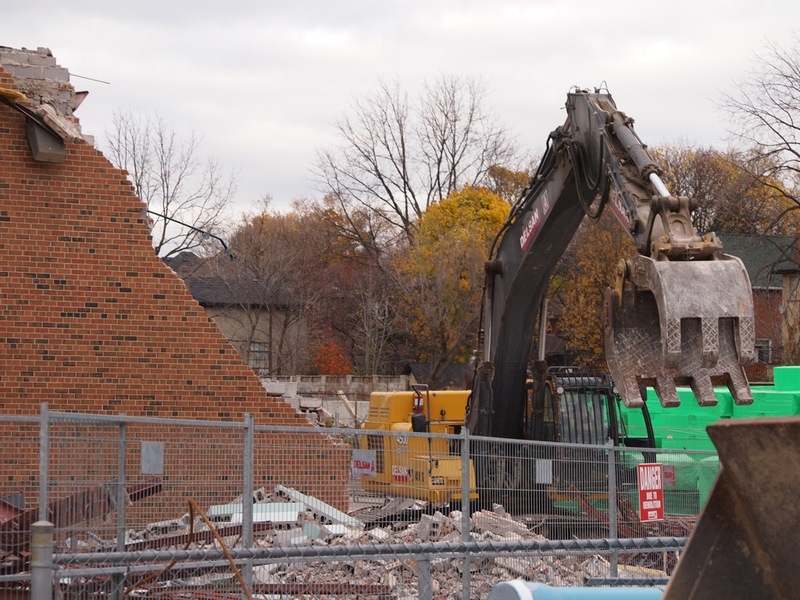 The jaws of heavy machinery tore into the bricks of a school today like a T. rex working the shoulder of a parasaurolophus. Schoolboys all over the city cheered. The moment must have been more bittersweet for the many alumnae of St John The Evangelist, which is about 60 years old. Demolition started today on the school in preparation for its reconstruction. The machinery started working at the back of the school. I could see only a few men working on the site, but they seemed to be making a quick job of it. 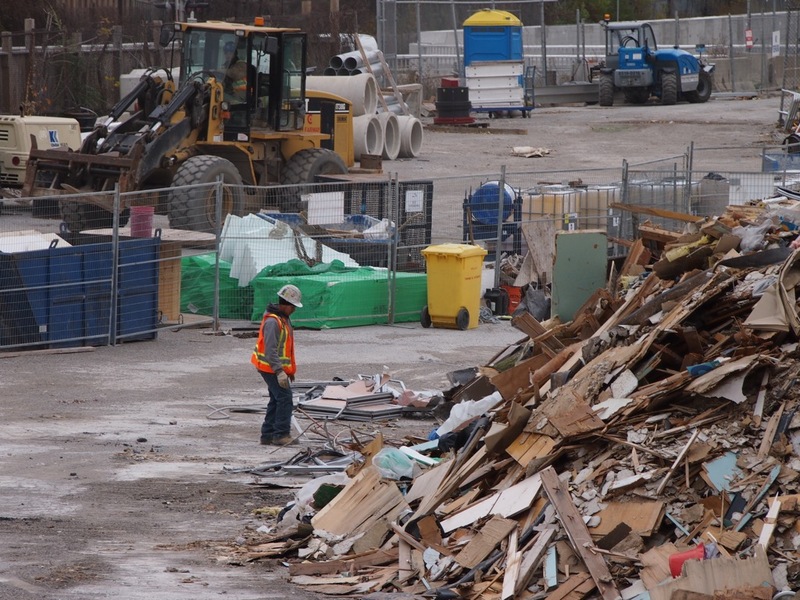 Dave Bennett, the chair of the SAC, said that demolition would take a few weeks. The new and improved school is to be ready for the 2016 school year. The CBC says that “dozens” of graves have been discovered at the building site of St John The Evangelist Catholic School. The graves are from the late 19th century. Archaeologists so far found 57 gravestones and “dozens of bodies”. A few graves had been found earlier, and the school had said that they did not expect construction to be delayed—though the Archdiocese recommended further study. Martin Proctor says that many graves were moved in the first half of the twentieth century, although probably not in a systematic way.